FIVE-YEAR-OLD Adriel Michaela Leow used to turn her nose up at the sweet potato leaves served at home for dinner. But ever since she pitched in to help grow and harvest the plant at a garden in her pre-school, her appetite for the vegetable has grown. She has even helped to cook them in the school's kitchen. 'Getting close to nature has made her more receptive to try new things and she learns a lotmore with this hands-on approach,' said her mother, Madam Yvonne Lee, 40. For turning an ordinary garden into a stimulating arena where children could learn about nature, Etonhouse Pre-school in Mountbatten has been given the top award in this year's Community in Bloom Awards, spearheaded by the National Parks Board. The biennial awards, held for the fifth time, highlight and reward excellence in gardening efforts. The only pre-school to garner the top honour, Etonhouse received the award at the Singapore Garden Festival last Saturday. Besides growing herbs and vegetables, the children created a sanctuary for sunbirds. Walkways to the school were also lined with creepers to provide shade. A particular species of creeper was grown because it attracted butterflies. And when the butterflies laid their eggs, the children took them into the classroom to see their transformation from caterpillars into butterflies. 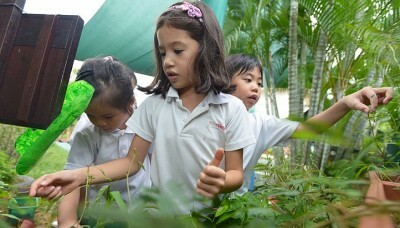 Even when things went awry, nature provided opportunities for the children to find solutions, said Ms Josephyne Ho, a senior preschool director from Etonhouse who started the school's green movement in 2007. For instance, when the children realised that their vegetables were being eaten by grasshoppers and birds, they put up a scarecrow. 'I was sad that the cabbage was eaten so we asked the teacher if we could use an old uniform to make a scarecrow,' said Claire Mayer, six, who said she enjoys the garden for the 'pretty flowers, the air and the sun'. The children spend about an hour outdoors every day; storytelling and drawing lessons are also sometimes held there.